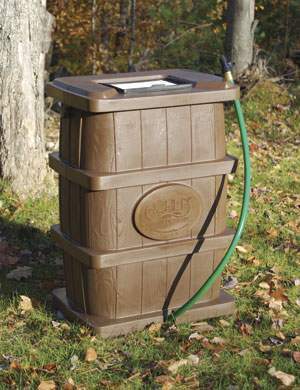 This speciality rain barrel holds 50 gallons of fresh, collected rain water in a sturdy antique looking wood grain exterior square barrel. For practicality this rain barrel has a screen at the top to stop leaves, debris ect. from entering and contaminating the water. Very easy to use. Just place it under a downspout and let your practical yet stylish rain barrel do all the work.